After a decade of living the contemplative life at Hundred Acres Monastery in New Hampshire, Bro. Wayne Teasdale was invited in 1986 by Father Bede Griffiths, a English Benedictine, living in India and sharing the practice Advaita Vedanta in India, to join him. From that time on, Bro. Wayne drawing on this and many other trans-traditional relationships, particularly also with His Holiness the Dalai Lama, Bro. Wayne shared, and also published widely about, the common ground of contemplative experience. He authored many books, among them The Mystic Heart: Discovering a Universal Spirituality in the World’s Religions and A Monk in the World: Cultivating a Spiritual Life. 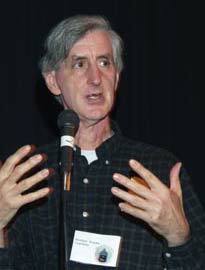 His other books include: Catholicism in Dialogue: Conversations Across Traditions ; Come and Sit: A Week Inside Meditation Centers; Hermitage of the Heart: Contemplative Practices from Hundred Acres Monastery; Community of Religions: Voices and Images of the Parliament of the World's Religions; Essays in Mysticism; Yoga of Sound: Healing & Enlightenment Through the Sacred Practice of Mantra (with Russill Paul); Bede Griffiths: An Introduction to His Interspiritual Thought (with Bede Griffiths); Awakening the Spirit, Inspiring the Soul: 30 Stories of Interspiritual Discovery in the Community of Faiths (with Martha Howard, MD)and Mystic Hours: A Daybook Of Inspirational Wisdom And Devotion. Taking a path of service as well, Bro. Wayne served on the Trustee board of the Parliament of the World’s Religions and the Bede Griffiths International Trust. He was also a leader in the Interfaith Call for Freedom of Worship and Human Rights in Tibet and was a member of the Monastic Interreligous Dialogue and helped draft their Universal Declaration on Nonviolence. As a Christian sannyasa (renunciate), which vows he took before Francis Cardinal George, the Archbishop of Chicago, in 2003, Bro. Wayne resided at the Catholic Theological Union in Chicago, where he taught as an adjunct professor of Spirituality. He also taught at DePaul University and Columbia College. Brother Wayne held an M.A. in philosophy from St. Joseph College and a Ph.D. in theology from Fordham University. Member of the ISDnA network first met Bro. Wayne in New York City in 2002. InterSpiritual Dialogue was founded under Bro. Wayne’s tutelage through members of the United Nations non-governmental organization community in 2003 and Bro. Wayne was intended to host, with that group, a session on his interspiritual vision at the 2004 Parliament of the World’s Religions in Barcelona, Spain. Too ill to attend, the session was hosted by members of the network and Bro. Wayne transitioned on October 20, 2004. In 2005, friends, persons, and groups inspired by Bro. Wayne worldwide gathered at The Crossings retreat center in Austin, Texas, and as result of that meeting, the international network ISDnA was inaugurated.